There are many schools and madrashas in the rural area of Bangladesh. But most of them don’t have enough teachers to run school program well. Moreover, most of the teachers of those schools don’t have any training to keep themselves updated with the new education system. Keeping this in mind, Secondary Education Quality and Access Enhancement (SEQAEP) has started a project to provide teachers in the schools of 64 Upazilas of 64 Districts. SEQAEP has planned to appoint 6000 assistant class teachers in 2000 schools and madrashas. They already have appointed 4500 teacher in various schools and madrashas of many districts. More 1500 teachers will be appointed this time. Teacher will be appointed for Math, English and Science. Both male and female candidate will be able to apply for the post. There’s no age restriction. So anyone who graduated (Honours/Degree) having at least 50% marks will be able to apply. There will be no selection test. Candidate will be selected according to their merit and result. Salary for 1st class graduate will be 25000tk and 2nd class graduate 22000tk. 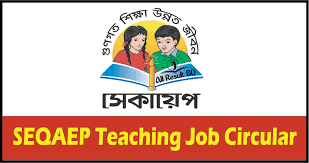 Visit www.seqaep.gov.bd/jobs to apply for the post. Application is open till 21st July and candidates will have to send all other necessary documents to Project Manager via mail. PreviousWhere to study Media and Journalism in Bangladesh?